In April of 2009, network, cable and print outlets responded to the emergence of the tea party movement with condescension, outright hostility towards the participants and crude sexual innuendo-based ridicule. ABC's Dan Harris insisted they were "largely orchestrated by people fronting for corporate interests." CNN trashed the first rallies as "not really family viewing." These insults were capped off by MSNBC bringing aboard actress Janeane Garofalo to scurrilously charge the rallies were only 'about hating a black man in the White House.' Here's a summary of the most-obnoxious and hostile coverage, illustrated with several videos, on ABC, CBS, NBC, CNN and MSNBC, as well as in USA Today, the New York Times and the Washington Post. 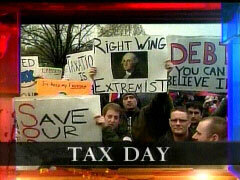 Reporter Derides Anti-Tax Tea Parties: "Not Family Viewing"
— NBC's Chuck Todd on Today, April 15, 2009 hours before the anti-tax rallies began. "Let's be very honest about what this is about. It's not about bashing Democrats, it's not about taxes, they have no idea what the Boston tea party was about, they don't know their history at all. This is about hating a black man in the White House. This is racism straight up. That is nothing but a bunch of tea-bagging rednecks....Fox News loves to foment this anti-intellectualism because that's their bread and butter. If you have a cerebral electorate, Fox News goes down the toilet, you know, very, very fast....They have tackled that elusive...Klan with a 'K' demo." On the April 13 broadcast of the Rachel Maddow Show, both Maddow and liberal Air America's Anna Marie Cox attempted to match dim-wits with Shuster's 'tea-bagging' humor as the two used the term at least 51 times in a 13-minute segment, as detailed in a Business & Media Institute post. America's major newspapers wrote either very little about and/or used cherry-picked data and poll results chosen to undermine the intent of the events. — MSNBC's Keith Olbermann on Countdown, March 22, 2010. — The Washington Post's Colbert I. King in a March 27, 2010 column. — New York Times columnist Frank Rich, March 28, 2010. Does Tea Party Whiteness Make You "Uncomfortable?" 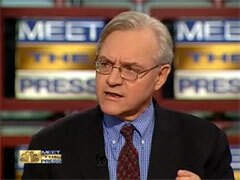 — Former Washington Post and New York Times reporter E. J. Dionne in his July 15, 2010 Washington Post column.